The Right Stuff: Partners Francois de Tessan and Rob Larman of Bistrot La Poste do a lot in a small space. So we went to Bistrot La Poste last night, and I'm now suffering from a restaurant hangover. This is where you wake up feeling wobbly and fusty--not from excessive drink, but from excessive food, drink, joviality, food, conversation, dessert, coffee, last bite of dessert, and a long and full-bellied drive home. But we have no regrets. You can hardly set a toe into La Poste before it becomes apparent that, for the duration of your stay, you will be dining on La Poste's terms. Those who are sports in this arena will have a smash-up time, and those who have very specific expectations of what a proper dining experience should entail would do better to stay home. Here's the deal. You walk in, then right away you turn around and walk out and mill around by front window until the restaurant can seat you. La Poste (which is a stone's throw from the Sonoma post office) is itself the size of a postage stamp, affording no space for idle expectant diners. Our table for three was wedged into a corner, and maitre d'/ringleader/co-owner Francois de Tessan brusquely corralled us into position: "OK, you first. Now you slide in there. And you last. Now I'm scooting in the table. OK, now you can move more to the left. Perfect." This is the tactic it takes to pack diners into the tiny quarters; everyone sits so closely together that you will be talking to your neighbors. And for sure it will start off with this icebreaker: "Oh, excuse me, I didn't mean to bump into you." Ah, but it's all in good fun. Settling into La Poste is like going through a magic time-space warp into a living Robert Doisneau photo--yes, it is that French. As I've never been to Europe, this is all a hunch, but certainly there are no Great American Steakhouse vibes within a 100-yard radius. The floor is multicolored tile that's been buffed with time, and there are patches of yellow bloom in ghostly blotches on the pressed tin ceiling. Bench seating--above that a smoky mirror, and above that a narrow shelf--runs around the entire room. What I gather is an ancient postal uniform hangs on a hook on the wall, and issues of Paris-Match and bottles of Campari and Lillet dot the shelves. The menu is written up on a chalkboard. In French. So putting my pricey culinary arts degree into action, I served as translator for my Aunt Sharon and her friend. Though I'm too much of a pansy to work in a restaurant, I can hella read a French menu. No matter though, because a server, in a long white apron, came over and gave a very poised English rundown of the menu. This reassured Aunt Sharon and her friend--who didn't trust my French--though we did have to strain to hear over the din of chatter and clanging silverware. Slices of baguette were brought out, followed by a plate of warm gougères, pastry puffs laced with sharp Gruyère cheese. It made me want a glass of rosé, so I ordered one. Our main server suggested that we order a bottle; we agreed, and then he ducked into the back to see what they had. Seconds later, he emerged with a bottle of Bandol-Domaine Ott, which at $39 was at least $14 more than a bottle of the other rosé I had initially ordered a glass of. We loved the lightly fruity, wispy-dry and rusty-pink wine, but I wish our server had mentioned the price difference (which I later discovered when examining the bill). Overall, La Poste's wine list is on the short side, and at least half of the bottles are French. Taking cues from the table next to us, we ordered the starters that looked the best. My aunt got the chiffonade du crab ($13.95), a stack of shredded radicchio and endive crowned with hunks of crab and a crest of neon-orange flying-fish roe. In the light but tart vinaigrette, the salad's crisp, almost pickled lettuces were tamed by the buttery crab. Lovely. The betteraves and mâche ($8.95) may have been even lovelier. Diced roasted golden and purple beets were paired with avocado and delicate sprigs of mâche. The earthy beets yielded to the rich avocado, a fine pairing. I could not help but order the friture de brandade ($7.95), orbs of salty-garlicky-flaky salt cod and potato purée rendered golden by a stint in the fryer. They came dappled with a lemony mayonnaise whose potency held its own against the steamy fritters. They looked like hush puppies, and I ate them with my fingers and didn't feel badly about it. As it was my aunt's friend's 50th birthday, we took pictures of ourselves with our food all throughout dinner. When you turn 50, you should be able to take pictures of whatever you damn well please and not feel squidgy about it. De Tessan then led the whole room in bellowing out "Happy Birthday," and it wasn't forced or cheesy at all like it is at the Olive Garden. Aunt Sharon and Birthday Girl scored with their entrées. The carré d' agneau ($25)--a rack of four juicy lamb chops with spinach and an insane blue-cheese potato gratin that must have packed in an entire cow's worth of butterfat--enthralled Birthday Girl. The scallops ($22), three huge ones atop a ridge of potato purée, were given a lively acidic twinkle with a topping of sautéed tomato concassé and sweet onions. Meaty roasted Brussels spouts and slightly underdone haricots vert came on the side. The pheasant (aka faison) schnitzel with fried sage ($25) was not particularly thrilling. I screwed up and ordered one too many fried things that night, so it's kind of my fault. The breading was too thick and bready, and I'd have liked the meat to have been pounded thinner. The faison, too, came with the heart-attack potato gratin. Aching for vegetal matter, I ate Aunt Sharon's Brussels sprouts. Dessert is worth saving room for (good luck! ), and it was impossible to resist the chocolate mousse after we had seen de Tessan carry out a soufflé dish full of mousse ($6.95) and ceremoniously plate it at a nearby table--a huge, free-form blop of mousse and an equally massive cloud of whipped cream. Holy cow. The silky stuff was as intense as a naked truffle. We also ordered the tarte citron ($7.95), whose sunny filling was pleasantly puckery and whose crumbly crust had a nutty edge. I couldn't decide which was better, the mousse or the tart, but for half an hour we nibbled our ways through each, chasing the microbites down with robust sips of coffee from a French press. The later it got, the more Edith Piaf crooned over the sound system, and the more we spotted chef and co-owner Rob Larman (of Rob's Rib Shack, also in Sonoma) venture out to the dining room. The staff sat down to their staff meal, and we grew sleepy and waited for our check. Perhaps we were not aggressive enough in vocalizing our readiness, but we were still laughing and carrying on and such. The size constraints of La Poste's dining room do compromise the level of service, but it's no big deal; clearing dishes involves a lot of passing and reaching, and it does not happen quickly. There's only room for two servers to snake their way through the room, and they can't do everything lickety-split, though the pace at La Poste is not meant for that anyway. Sit back, enjoy the ride, gab with your neighbors, eavesdrop on other tables' conversations, and leave your schedules at the door. I think I'll eat at La Poste when I turn 50, in fact. 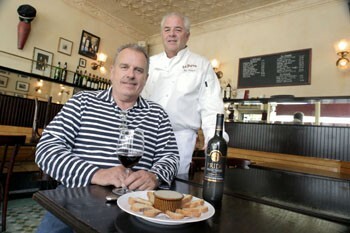 Bistrot La Poste, 599 Broadway Ave, Sonoma. 707.939.3663. Dinner Wednesday-Sunday. www.bistrotlaposte.com. From the June 26-July 2, 2003 issue of the North Bay Bohemian.